Nor was Rullière willing to place confidence in the command qualities of either man: “I repeat, I do not believe General Herbillon and Colonel Carbuccia capable of successfully conducting these operations,” he continued.40 Worse, the individual shortcomings of the two men were magnified tenfold when they were placed in tandem. In Rullière’s opinion, Herbillon “is not in a state to lead this operation…. He is extremely irresolute and will not make decisions.” [Italics in original.] One of the Armée d’Afrique’s young prodigies, Louis de Lamoriciere, who was to be exiled to Rome after President Louis-Napoleon Bonaparte proclaimed himself Emperor Napoleon III on December 2, 1852, suggested assigning another general to him, “… to compensate for his weakness … [but] today even you admit the inadequacy of this precaution because General Herbillon does not necessarily listen to the opinions of his equals in rank.” And, as was to become apparent as the operations progressed, he was to prove a poor planner. Herbillon’s irresolution meant that he was bound to be dominated by his headstrong subordinate, Carbuccia, for whom Rullière obviously had no great affection. Algerian Governor-General Viala Charon’s view of Carbuccia differed little from that of Rullière. “I followed [Carbuccia] throughout his career and I always found him the same,” he wrote to General Jean-Jacques Pélissier when he learned of Carbuccia’s death at Gallipoli, a staging point for the Crimean expedition, in 1854, “looking for popularity at the expense of the dignity of man, and often implacable with the weak and servile in the presence of the powerful. He drew Herbillon into more than one mistake at Zaatcha….” In early September, Rullière told the governor-general to select one of the Armée d’Afrique’s stellar commanders, like Pierre Bosquet, or Saint-Arnaud, to command the expedition. On September 22, he placed the earlier suggestion in stronger terms, by informing Charon that the president of the Republic and the council of ministers “invited” him to choose another commander. But, as often happened in colonial affairs, orders from Paris could be conveniently ignored or arrive too late to be executed. The colonies were a law unto themselves. At eight o’clock on the morning of October 7, 1849, Herbillon arrived before Zaatcha with 4,493 men, about 1,000 of whom were Carbuccia’s legionnaires, and eleven artillery pieces served by 300 artillerymen. This army established its base on a small hill called the Coudiat-el-Meida, about 550 yards to the northeast of the oasis edge. From this small promontory the soldiers could look out over Zaatcha, to Farfar and the Tolga oasis beyond. In the midst of his army, Herbillon must have looked the very picture of confidence—his slender frame, his tunic with great gold epaulets, the beard that surrounded his mouth, and the kepi tilted rakishly over his right ear made him look younger than his fifty-five years. And, on the face of it, he had no reason to worry. After all, his force was almost a quarter as large as that sent against Constantine in 1837, and Zaatcha was a mere fly-speck compared with what had been one of the greatest, and most formidably bastioned, cities in North Africa. Now, while dividing one’s force in the face of the enemy is not a tactic recommended by most staff colleges, and one that certainly brought on the demise of Custer at the Little Big Horn and Lord Chelmsford at Isandl-whana in 1879, Herbillon’s troops, if so divided, would not have been out of touch with each other, but close enough to offer mutual support if attacked. If Herbillon really feared this as a possibility, he could easily have organized mobile groups, fire teams that could have rushed to any portion of the trenches in danger. But neither the trenches nor the French base camp ever came under serious threat. In 1865, the French were able to surround and successfully besiege Oaxaca, a Mexican town of twenty-five thousand inhabitants built partially on hills, with a force of essentially equal size. And this exposed the second fatal weakness in Herbillon’s logic. The Arabs had no interest in coming out of Zaatcha. They wished to fight a defensive battle, force the French to attack them. The only time they seemed prepared to sacrifice this substantial tactical advantage, apart from occasional raids on the trenches, was when the French began to cut down their date palms. But Herbillon’s decision was final: “All our efforts should therefore concentrate on one point, and after mature reflection, the general decided that the trench depot would be established at the zaouia, .. ,” The results of this decision were not difficult to predict—Zaatcha was allowed to resupply and reinforce each night because the critical west face of the town, which contained the gate and the road out, were never invested. Therefore, at the outset Herbillon sacrificed a weapon vital to the success of so many sieges—starvation. And while the Arabs could draw on an almost inexhaustible supply of fresh manpower from the outside, Herbillon had virtually drained the garrisons of Constantine Province and had to beg fresh forces as casualties, disease and the climate took their toll. There is some indication that Herbillon believed a decisive demonstration by his force would persuade the Arabs of the futility of resistance. But, if true, he was destined for disappointment, for things began to go wrong from the very beginning. In what was to become a too familiar accusation during the course of the siege, Herbillon blamed his initial setbacks on Carbuccia, who was ordered to seize the zaouia with the infantry, which included six hundred legionnaires. The commander insisted upon the limited nature of this operation to his subordinate: “Colonel Carbuccia was given a formal order not to go beyond the houses grouped around the minaret and, above all, not to pursue the Arabs into the gardens which were unknown to us,” he wrote. “This order was passed on and repeated several times orally to the troops.” This done, the artillery opened fire, collapsing several walls. The Arabs scattered and the troops seized the zaouia almost without resistance. In fact, so effortless was this opening attack that, “… in the heat of the action, officers and soldiers totally forgot [their orders] and pushed into the gardens where the Arabs, hidden behind the walls, directed a murderous fire at them. Many of them, marching blindly, even got to the crenelated walls of the village, where several were killed.” Although the blame for this fuite en avant (forward flight) was laid at the feet of the Chasseurs à Pied and the zéphyrs, rather than the Legion, the result was the same. Realizing the danger, the soldiers began what Herbillon described as a “precipitous flight,” which stopped only when they reached a small “mountain gun” whose rapid fire kept the pursuing Arabs far enough away to allow them to rally. This opening action of the second siege of Zaatcha by the French exposed the shortcomings of Herbillon’s approach. The first was that he had underestimated the skill and determination of his adversaries. He admitted that he had hoped the seizure of the zaouia would deflate their will to continue. In fact, he had handed them at the very least a moral victory at this critical opening stage—how could they not be encouraged at the sight of the mighty Armée d’Afrique fleeing through their gardens, leaving behind quite a few of their twenty-five dead and dragging sixty-seven wounded with them in retreat? “The cadavers of our soldiers produced the greatest enthusiasm among them,” Herbillon admitted. “Bouzian proceeded to announce [the defeat] in the neighboring oases by sending as trophies clothes stripped off them. 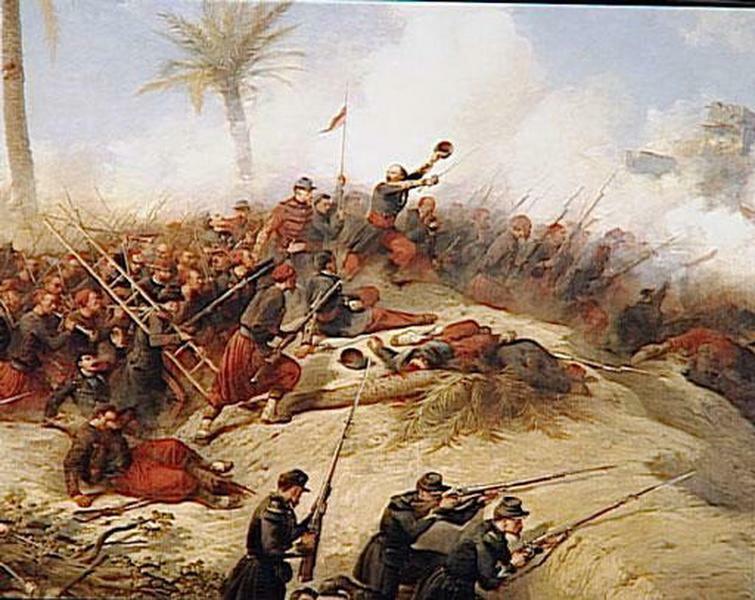 This spectacle was visible proof, strong medicine which increased the numbers of his partisans (some from as far away as the Tell) and encouraged those already with him.” Needless to say, had the oasis been invested completely, Bouzian would neither have been able to get out to announce his victory, nor those tempted to support him to get in. This entry was posted in France, History by MSW. Bookmark the permalink.